E|MERGE is a two-week long annual creative residency that provides a fertile space for the interchange of ideas, artistic innovation, and discovery of new models of creation that extend far beyond the residency itself. The E|MERGE Interdisciplinary Collaborative Residency curates performance and visual artists, activists, scholars, and those interested in developing new forms across disciplines. E|MERGE works to promote the interchange of ideas, artistic innovation and the creation of new collaborative models continuing beyond the residency itself. This residency is ideal for those interested in collaborating and cross-pollinating ideas across discipline and background. Applicants must demonstrate a commitment to cooperation and an interest in collective decision-making processes. The residency culminates in a final weekend of performances, panel discussions, writing, research, and other modes of expression. Earthdance enthusiastically encourages participation across social differences including race, sexual identity, gender, age, class, and ability. E|MERGE was co-founded in 2009 by Krista DeNio, Dan Bear Davis, Karen Bernard, and Melinda Buckwalter, in collaboration with Earthdance. 2 beautiful, large dance studios with sprung maple floors and radiant heating. Several cabins and other spaces ideal for installations, video/sound editing locations, and unconventional performance spaces. 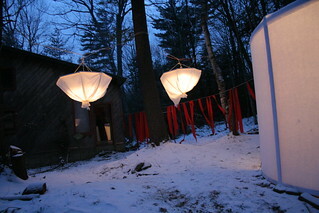 The great outdoors: more than 125 acres of (snow-covered) meadow and forest for art-making and respite. A church and community center for site-specific work (through collaboration with a local congregation). 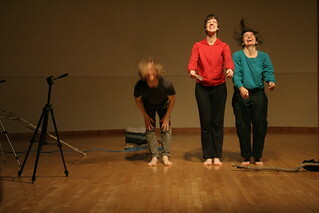 Some collaborators will be invited to lead workshops or labs within the residency and/or the public. Our hope is that participants will take advantage of this time for creative research, engaging one another and the public directly with your current exploration research and curiosity. $600: This fee for the 14-day residency which includes meals and accommodations. We encourage participants to solicit private sponsors, and will happily offer a letter of participation and supplemental materials. We're compiling a list! Please email emerge@earthdance.net with additional resources you are aware of, location-specific or otherwise. We will organize an opportunity for you to share your work at some stage of development with the local community. All participants assist in cleaning and cooking during the residency. This is an integral part of the community living experience at Earthdance. Earthdance conducts fundraising to build the E|MERGE Scholarship Fund; this fundraising campaign benefits from your support! Tell your family, friends, and network about the positive impact of the program and direct them to: http://www.earthdance.net/support/emerge. Thank you [E|MERGE] for reminding me what it means to create from a place of joy and laughter rather than stress and frustration. The two weeks were very inspiring. Fascinating encounters happened within the projects and workshops, but also around them in various informal exchanges - and I do not mean only with each individual, but also in relation to the kind of collective that arised from our gathering at earthdance. E|MERGE is one of the most innovative arts residencies imaginable. It is incredible to have at one's disposal, a group of exquisitely talented interdisciplinary artists who not only have skills, but also have concentrated space and time to work together. The collaborations that result are unique and surprisingly unpredictable... As an artist the Emerge residency gave me both the resources and the time to create what would not have been possible to create elsewhere. The place became as much a part of the content of what was created as the content of the piece itself. Artists are meant to learn from each other, and to defy the hierarchical relationships that have perpetuated mentor/student dysfunction, internalized oppression, isolation, etc. E|MERGE presented a model for interrogating those relationships, breaking them apart, and re-forming them in new ways.